Restocked & back in vogue? Reissue of this loner/Real-People album originally issued in 1976 by Higney himself, originally reissued on CD in 2004. One of the classic Paul Major discoveries. 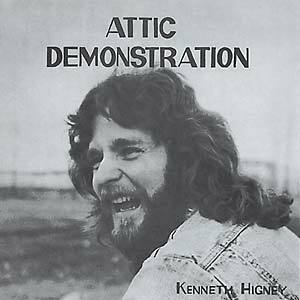 "Kenneth Higney was a struggling singer-songwriter when he cut Attic Demonstration in 1976, a demo record of such massive outsider vision that it dropped straight into the void, as well as the deep pockets of a band of committed record collectors. Initially intended as a calling card to help him get his songs covered by other artists, Higney soon branched out into selling the disc as an actual album, placing low key ads in a couple of NY papers and sending out a bunch of review copies. Only Trouser Press took the bait, saluting Attic Demonstration's 'cross between Lou Reed and Neil Young without the aid of melody.' Now 'officially' available for the first time, Attic Demonstration is one of the most endearing and intensely human 'real people' discs to turn up for a while, boasting Modern Lovers-styled road ballads sung with a Jagger-esque sneer and propelled on pegleg rhythms that would do The Shaggs proud, through meandering tonal wastelands where Higney's eye wateringly unarmoured vocals are supported by minimal chord patterns that progress according to the position of the stars. Best of all is the addition of both sides of Higney's funk/punk tribute single, where he namechecks contemporaries like The Dead Boys and Johnny Thunders and rhymes 'dirty downtown bar' with 'the sissy music of John Denver'. Almost too good to be true." --David Keenan/The Wire.